An easy one-pan supper recipe for chicken that cooks up moist and tender like a rotisserie chicken that's surrounded by mounds of flavorful rice! Lord have mercy on me and mine! We have slap been burning it at both ends lately! This time of year is always crazy for me because on top of our busy life and schedule, this is the time of year I think I have a green thumb and want to play landscaper. And… dun dun dunnnnnn…. the onions are officially old enough to really, fully, productively help. And they are NOT happy about it. Ha. Too bad sweet cheeks! The glory days are over! Your weekends will now be spent pulling weeds, bagging leaves, raking, watering stuff and anything else I feel like making you do! And in exchange for that you get to live here and eat on a regular basis! Ain't life grand! OK, I’m not really that tough, we did take them to the movies this weekend too and pay them an allowance so you can quit typing that anonymous email to DSS. Since we've been getting the yard ready for summer, I was trying to think of something I could throw in the oven and forget about when I remembered this dish Mama used to make! 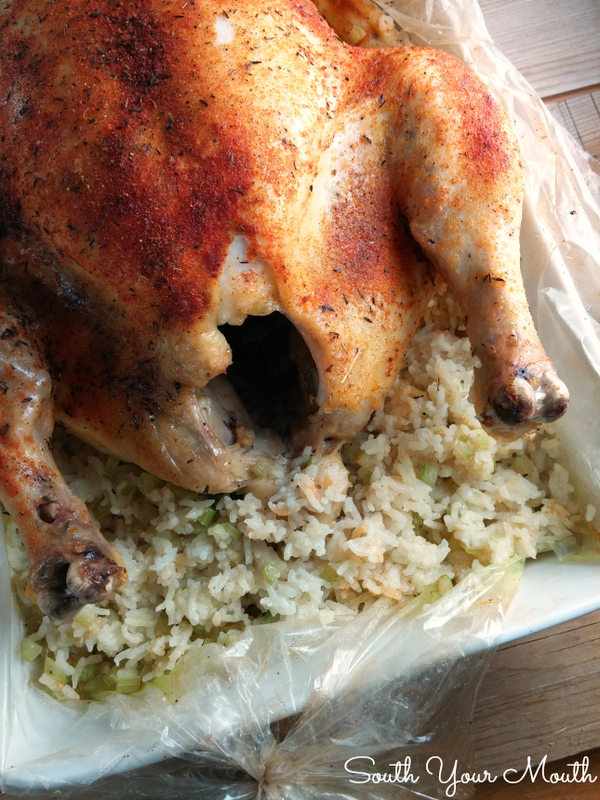 It’s so easy and when you’re done you have a chicken as moist and flavorful as a rotisserie chicken and a boatload of rice! p.s… I like to use the leftover rice to make fried rice later in the week! Rinse chicken and remove any giblets from center cavity. Pat dry with paper towels. Rub the chicken with olive oil. Flip the chicken upside down (breast-side down) and sprinkle with a little less than half of the Chicken Scratch. Flip the bird right-side up (breast-side up) and sprinkle with remaining Chicken Scratch. Place the baking bag in a 13x9 baking dish with the open end at one of the short sides. Add rice, celery, chicken broth, salt and pepper to the bag and stir to combine (or just jostle the bag around a bit). Place the seasoned chicken in the bag on top of the rice. Puff up the bag to keep it from sticking to the spices on the chicken then seal with the tie (I blew into mine like a balloon to do this – it was oddly embarrassing but it worked 🙈. Cut three 1/2-inch slits in the top of the bag to vent. Place dish in the oven and bake at 375 degrees for 1 hour and 20 minutes. Remove the dish from the oven and cut open the baking bag. Insert a thermometer into the thigh to ensure the temperature is at 175 degrees. If it isn't, see notes below. Let dish rest, uncovered, for 15 minutes before serving. To serve, remove chicken to a cutting board and carve into separate pieces. Arrange pieces over rice in baking dish. Note: If you’re using a 4-5 pound bird, the chicken should cook through just fine (anything bigger and maybe not). If the chicken isn't quite done, fear not! 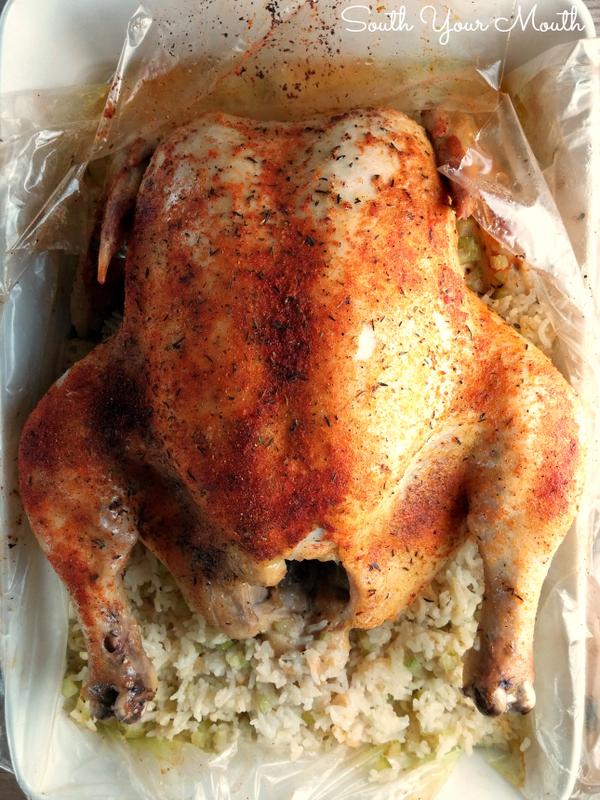 Lift the chicken out of the bag and set into a second baking dish. Return the chicken back to the oven and cook, uncovered, for an additional 30 minutes or until chicken is done. 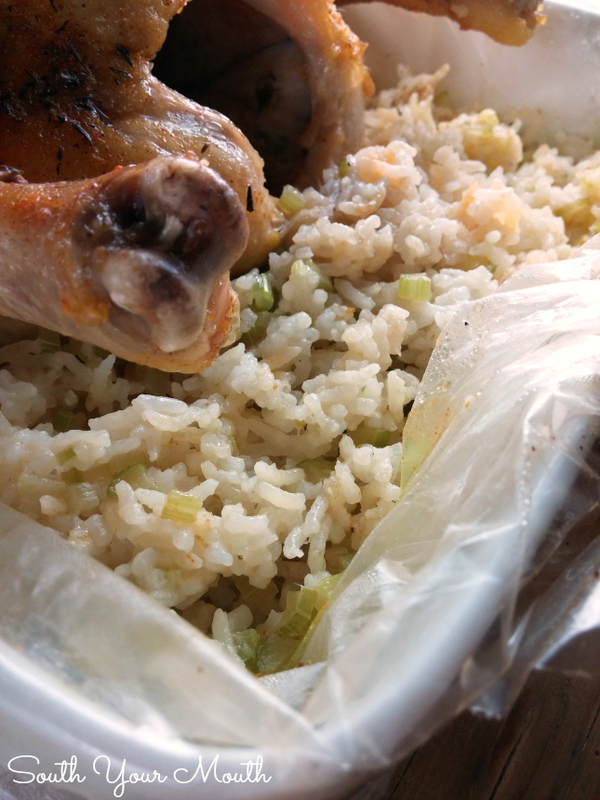 Meanwhile, leave rice in the bag in the dish and cover with aluminum foil to keep warm. would this recipe still work for cut up fryer chicken? I think so! I'd reduce the cook time to about an hour and 10 minutes then check for doneness (if it's not done, just throw it back in the oven). Good luck! Will the chicken brown in the bag? Also, do you do anything to your rice before putting it in the bag like rinsing? Mine always seems to clump when I cook it this way. Maybe I'm cooking it too long. I have cooked this b4, only used Morton's seasons salt instead of chicken scratch seasoning. I like to add sliced fresh mushrooms, frozen pearls onions - just a few and cook it for 2 hours. The cooking time makes the chic cooked how we like it and it is still moist and rice is fine. I will try next time with ur chic scratch seasoning! Oh, I meant to tell u that sometimes my husband wants the rice a little bit "gravy" like so when he wants it like that, I leave out the mushrooms, and add 1 can of cream of mushroom soup to chicken broth and mix well. Sometimes I even add carrot shoestrings ( I buy from store) and give them a chop or two so they R not too long. This is my way of adding extra vegi's, it's in creamy "gravy" rice - who is gonna complain? is it long grain rice you use? and chicken pieces work just as well? This looks sooooo good! Yes, long grain rice. I think pieces would work just fine! Can I cook this in my crock pot?? I work nights and would love to come home to this meal.. This is a seriously amazing recipe. I tried this today and I usually don't get recipes right on the first try. Today, it was perfect! Thanks so much! I recently made chicken soup with a whole chicken and there was an enormous amount of fat from the chicken. Do you think there might be a way to do this recipe so the rice wasn't sitting in a lot of fat?? Trying to eat healthy. You can trim off a ton of extra skin around the cavity openings so that should help. This recipe makes a TON of rice so the fat gets distributed pretty well.